I've had carbonara on the brain for quite some time. See, when I come across an intriguing recipe, I file it in my mental recipe rolodex. There is a also a mental shoe rolodex, a bag rolodex, and a people-who-annoy-me rolodex. Unfortunately, the last one is currently overflowing. What? I've had a cranky month. But I've been saving carbonara for a special week. A week of broken high heels, coffee spilled on white dress shirts, and Don King hair. And of course, my life did not disappoint. Last week, I ran to pick up my dry cleaning three seconds before the place closed. This was a huge victory since the dry cleaner is a surly little man who was literally waiting to slam the door in my face at 7:00 p.m. I grabbed my dry cleaning and skipped out, relishing winning this round of me vs SDC (surly dry cleaner). The victory was short-lived because the next morning, I pulled in to work and the second my car entered the parking lot, I spilled coffee on my recently dry cleaned, white shirt. And somewhere out there, I knew that SDC was dancing a little jig. With that auspicious start, things quickly went downhill. The airconditioner at work started spitting out hot air. In Texas. In the middle of summer. Then, the voicemail system broke and when it was finally repaired, I had sixteen voicemails with at least six from the same client. A client I am almost certain is related to SDC, judging from his sunny disposition. To top it all off, someone stole my coffee mug. The one with a hippopotamus on the handle. As an aside, if you have stolen my coffee mug, you should know it's cursed. Ok, it's not but you are a grown man or woman and it does not behoove you to use a mug with a giant, cartoon hippo on it. Only I can pull that off. There was only one meal for a week like this. Pasta carbonara. Garlicky, creamy eggs and (beef) bacon fat coating warm strands of perfectly chewy pasta. As an aside can I once again proclaim my love for beef bacon? It shines (with fat) when compared to turkey bacon and I am eating it in large quantities to make up for the past 28 years. My arteries and I have never been quite so happy. Aside from being the most comforting meal EVER, it's also quick enough to qualify for a coveted spot in the Weeknight Dinners for the Working Woman (Or Man) series. On this particular night, I substituted scallions for parsley simply because I had scallions and didn't have parsley. And trust me, it was best for everyone that I did not stop at the grocery store. As another aside, has anyone ever gotten into a tiff at the grocery store? I see the craziest behavior (people cutting in line, eating candy bars without paying for them, leaving refrigerated items in random aisles) and sometimes, it takes all my self control to not go postal. For the record, the peeps shopping at my grocery store are by and large, larger (hee hee) than me and I'm afraid of being pulverized if I point out that yogurt is not a shelf stable product and you can't leave it amongst the canned soup if you decide you don't want it anymore. So, I took a deep breath and ate my carbonara while watching Entourage and wishing I was Ari Gold. I bet Ari would proudly tell grocery store ruffians where they could go. Then, I ate another bowl of carbonara. Boil pasta in the salted water, reserving cooking water to thin out your sauce later. 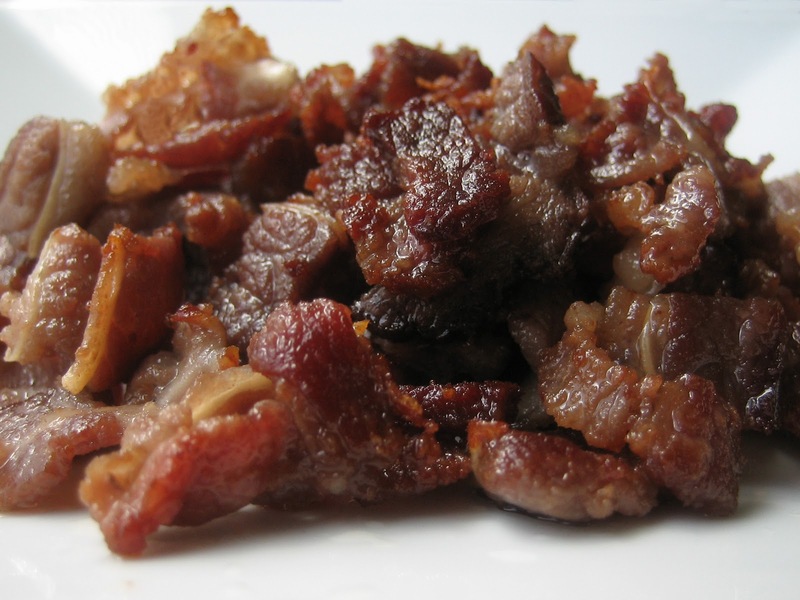 While pasta is boiling, cook bacon in oil until crisp. Remove from pan. Cook garlic in bacon fat until softened. Add the hot, drained spaghetti to the pan and toss for 2 minutes to coat the strands in the bacon fat. 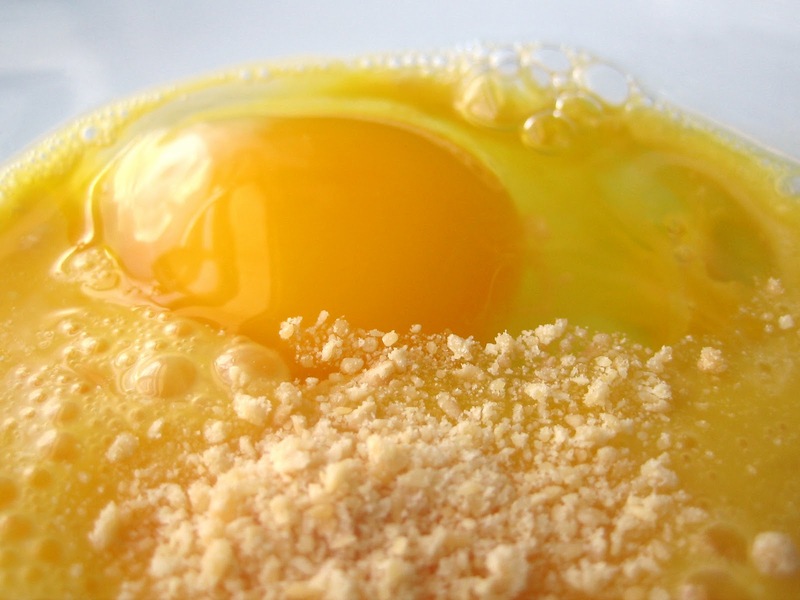 Beat the eggs and parmesan together. Remove pasta from heat and pour the egg/cheese mixture into the pasta, whisking quickly until the eggs thicken, but do not scramble. Thin out the sauce with a bit of the reserved pasta water, until it reaches desired consistency. Season the carbonara with salt and pepper and garnish with parsley (or scallions!). looks delicious! I've been thinking about doing carbonara since I saw it on martha stewart, batali I beleive made it. It looked so rich and delicious but I just cant bring myself to consume that many calories in one meal I want to! I have to try it soon. The regular grocery mart is almost as bad as wal-mart sometimes. I'm still floored at the fact that people go out in their pajamas , not only in their pajamas but at like 4 in the afternoon too. Are they taking a nap as soon as they get home or what? ::sigh:: My ultimate comfort food. I adore, crave, love, covet spaghetti alla carbonara. Your version looks wonderful too. I do hope you find your hippo. Can't believe someone would take a freakin' coffee mug. My my...this reminds me of my summer in Italy. Isn't it amazing what good, hearty food can do after a long and exhausting week? Where in Texas do you live again? My husband and I are moving to Austin in 13 days! Also, I hope whoever stole your mug is cursed with a lifetime of spilled coffee on their white shirts. That'll learn 'em. Thanks for a fun read but at your expense (for having a cranky month). I like rolodexes. hehe Especially mental ones. What better way to release some stress with food. A day like that you deserve a good meal! Fat from bacon is the best and so comforting. I don't blame you if you want to finish this dish yourself and ask for me :) It looks so good! I sooo have to find me some beef bacon. It's clearly life altering and essential. I've added it to my mental rolodex of things to do. Wow your week sounds...rough. Broken shoes? A rude dry cleaner (I can so relate to that one!)? Don King hair? Welcome to my life. I won't get started on the rolodex overflowing with rude people either. Carbonara....yum... I can imagine making this for my desi father who would automatically freak out at the bacon (even if it is beef). Despite the fact I don't eat bacon or meat even, he'd still assume I'd actually serve him pork. He still asks pizza places to clean the knife before cutting his pizza, if that tells you anything! Carbonara is one of the best foods ever ever ever!! Yours looks awesome... And you're totally right that Ari Gold would tell those grocery store people where to go! Ahhh, the ultimate comfort dish, pasta with creamy eggs and cheese. You've got me intrigued on the bacon thing and carbonara is always something I've wanted to try but never did because of the pork. I haven't seen beef bacon here, where do you get it? Ooh, sorry you've had such a rough week. I bet that delicious, oh so comfort sounding Carbonara made up for everything. I know exactly how you feel about wanting to say something but stepping back because you're afraid of being pulverized. Standing at only 5 feet tall, you can imagine how I felt during my good ol' Adult Basic Education teaching days when I had to question 6 feet tall adult males as to why they didn't finish their homework. Hope you have a much better week! I have to say, if anything was going to make you feel better about life...it was bacon. Carbonara is like an ultimate comfort food of mine! So delicious. I'm sorry about your rough week babe. I can't BELIEVE someone stole your mug. WTF! Wow carbonara is the shiz, I really love the parm ,eggs and bacon in the sauce. Must...resist..from licking computer screen. I love Spaghetti alla Carbonara. I am not so regular on twitter but following you. BTW I think I am your 50th follower so congratulations:). I loved your blog and will come back for more. I am SO going to be that person with the weird coffee mug/items in her office. I'd beat someone down if they stole my coffee mug though--so not cool. You should make a missing sign with a picture of the mug and post it around the office. Can you believe I've never had Carbonara? I have no clue why. Maybe because eggs and I aren't friends. But I don't even think I knew it contained eggs until just now. Whoa, that pic is unreal. 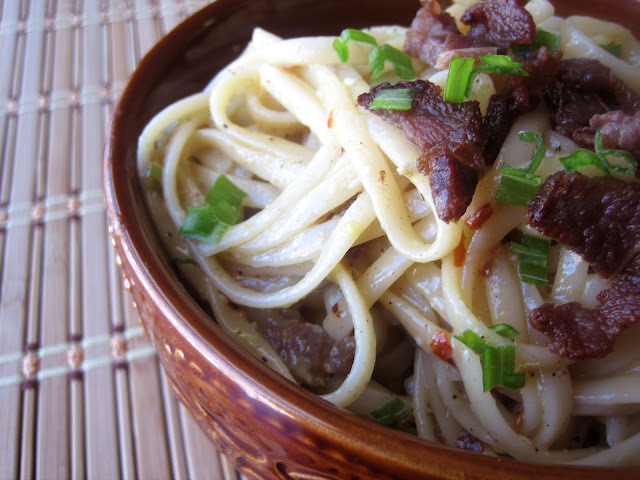 Now you've got Carbonara on MY brain! Yummm. This looks like the comfort dish that can turn anyones week around! Mmmmm! oh yum, I can see why you'd have that delicious meal on your mind! Carbonara can soothe even the crankiest of beasts! Yours looks fab, I know what I'm gonna be whipping up! This looks marvellous though I must admit - partially cooked eggs give me the willies. Don't listen to me though - your pasta carbonara is done to a turn! And why have I never seen beef bacon?! Very good info, this. Wow-I am going to start printing some of these recipes off, utilizing the great farmer's market I have right outside my door, and learn to cook! You make it seem so simple. Did I ever tell you I've caused two kitchen fires while attempting to cook? Or, that if you boil eggs long enough they WILL explode and hit the ceiling? Just made this for dinner tonight and my family loved it! I did make one change, since my body doesn't do well with Parmesan so I used a truffle pecorino which was declicious, thank you!